A most terrible incident has occurred at Frost Hollow Hall, the country estate of Viscount Barrington near the village of Frostcombe. It is the cold winter of 1881 and Till is dared by the butcher’s boy to go ice skating, little does she know his desired destination for this is a frozen lake in the grounds of the villages grand country house where a boy died ten years ago. The dead don’t scare Tilly, but when the ice cracks while she is skating and she is met by a boy so beautiful she is sure he is an angel, her thoughts about the dead change. The boy is reaching out for her, but he is not truly there, for he is a ghost and he is only there because he needs Tilly’s help, and for that she needs to be alive. Oh, oh my. I love Historical Fiction, and I love ghost stories… combine the two and I think you have found my true literary love, and if you can’t guess; Frost Hollow Hall combines the two beautifully. The story is brilliant, Tilly is so wrapped up in the idea of helping Kit that she can’t see other things going on around her, but the reader can and that makes it so much more special when she sees these things. Within this one book you have history, adventure, discovery, romance, mystery and ghosts; it’s jam packed with branches of the same story covering different things, but not so much that it comes across confusing; it reads brilliantly. I loved what was going on in Tilly’s life, the hall, the mini love triangle that wasn’t really and the time period of the book, aided especially by the plot line involving Tilly’s family. The characters are fantastic, I love that there is obviously a lot more to Will than meets the eye and he’s not the joker he likes people to believe he is, not completely anyway. I Loved how feisty Tilly was and how she wasn’t afraid to keep her gob shut, it got her into trouble a few times but it showed her personality well and I liked that she wasn’t showing anyone how afraid she was even at her most terrified. Other awesome characters included Dorcus and Gracie and even Mrs Jessop. I loved how much presence Lady Barrington had when she was on the page too and she really came across as a dominating character. Even the ‘invisible’ characters were written in a way that made them stand out and I especially loved the spirit who haunted the Hall. The mystery element of the book was done brilliantly and I honestly had no idea what it could have been unsettling the spirits right until its reveal. Quite often when I read literature aimed at this kind of age group which features ghosts and the like I don’t find it in any way unsettling or creepy whereas with Frost Hollow Hall I really felt the hairs on the back of my neck stand up! It has a classic feel to it much like Northanger Abbey or the victorian gothic literature you can read but aimed at a younger market and I really do love the style of Carroll’s writing. In the author bio at the front of the book it mentioned that Carroll’s next book is in progress and its set in a Victorian Circus, after reading this one there is no way I am missing out on that! 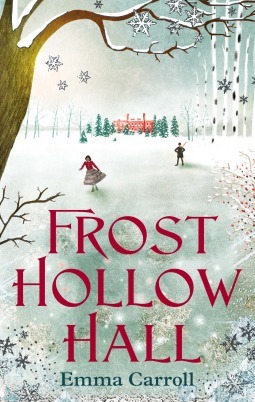 Frost Hollow Hall was published on October 3rd by Faber and Faber. My copy was sent from the publisher in exchange for an honest review.